North Washington is an unincorporated community in Butler County, Pennsylvania, United States. 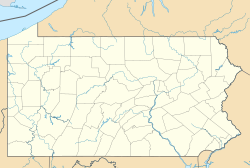 The community is located at the intersection of Pennsylvania Route 38 and Pennsylvania Route 138 13.5 miles (21.7 km) north-northeast of Butler. North Washington has a post office with ZIP code 16048. ^ a b "North Washington". Geographic Names Information System. United States Geological Survey. ^ United States Postal Service. "USPS - Look Up a ZIP Code". Retrieved July 16, 2017. ^ "Postmaster Finder - Post Offices by ZIP Code". United States Postal Service. Retrieved July 16, 2017. This Butler County, Pennsylvania state location article is a stub. You can help Wikipedia by expanding it. This page was last edited on 15 January 2018, at 11:45 (UTC).